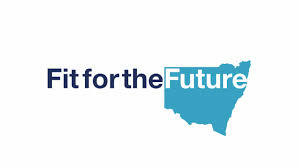 Fit for the future is an initiative of the NSW State Government designed to reduce the number of Council’s in NSW. Following are various views on this matter. I have received a brochure “Fit for the Future” from my Council. 1.Scale and strategic capacity should not be the threshold criteria. There is no evidence that a large council is more effective, has better rates nor provides better services than a small council. Small can be appropriate. Mergers in rural Queensland debilitated towns like Tambo and Springsure. The Clarence Valley NSW merger was a significant disappointment. Residents in McLean feel disenfranchised by Grafton. 2. Scale and strategic capacity should not be linked. The two criteria should be assessed separately. 3. Minimum Population: There should be no number target as Ku-ring-gai Council found out from unworthy Planning Ministers. 4. Scale: There should be no target number of Council for metropolitan or regional areas. 5. Strategic Capacity should have benchmarks to measure the ten elements. 6. Strategic Capacity is to be rated by pro-development government blessed top down behaviour . Scale and strategic capacity measured by enabling the State Government’s planned development should be removed. Residents need an opportunity to voice their opinion and be given a fair hearing. 7. Joint Organisations (ROC) should be returned as an option for all councils and time allowed to develop their business cases. 8. All submissions to IPART should be made public as soon as possible. 9. An extension of time for more respondents and give IPART time to consider all respondents replies should be appropriate. P.S.Radical change as evidenced in New Zealand is needed but unlikely to be adopted. Australia is over governed. Abolish State Governments and give more power to Local Government is my preferred way forward. As discussed my review of the Fit for the Future document, I hope this is what you were after! I received a letter from Willoghby Council about Fit For The Future. In order to fill out the survey I decided to review the Fit for the Future information pack. Unfortunately the information provided is purely financial and is not detailed enough for a detailed look. So based on the information provided here is what I found. Scenario 4) Willoughby Council merger with North Sydney, Lane Cove, Mosman, Hunters Hill and 2/3 of Ryde Council. For me operational performance (day to day operation) is important. So, for me, it is important that any merged council be able to meet the fit for the future operating performance target indicators. The information pack suggests that Scenario 2 and 4 will result in a council that does not meet the fit for the future operating performance target indicators. I eliminated scenario 2 & 4 for this reason. Additionally, the information suggested the council formed in Scenario 4 will have a large infrastructure back log to deal with (due to Mosman, Hunter’s Hill and Ryde councils). I note this week IPART (http://www.ipart.nsw.gov.au/Home/Industries/Local_Govt/Special_Variations_and_Minimum_Rates/Applications_Determinations) ruled on special council rate increases above the approved limit of 2.4%. I note that Willoughby, Ryde and Mosman councils all had their requests approved and a big reason for the council rate increases in each of the councils submissions was to fix infrastructure backlogs. I think Willoughby will address their issues over the next 5-7 years with Ryde and Mosman over 10 years. I do not know if the Fit for the Future information booklet considered these rate increases in Scenario 4. Either way, I only used the information booklet and have therefore eliminated Scenario 4 due to failure to meet Fit of the Future target indicators in the areas of operating performance and infrastructure backklog. This leaves Scenario 1 and 3. After review, there is not a lot of difference between these scenarios from a financial basis. So since there is not a lot of difference why change? – I know the eastern most and western most wings of the Willoughby Council area do receive some attention from Willoughby Council. Under a merged scenario of either Willoughby and North Sydney or Willoughby, North Sydney and Lace Cove will the most eastern and most western parts of the current Willoughby Council area receive the same service or representation or will they be forgotten? Here is “my say” on Council’s “Fit for the Future” document distributed for public feedback. This is a personal submission, from the viewpoint of a participant in Progress Association issues with Willoughby Council over the last 20 years. Fit for the Future ?? 1	It fails to address the full range of Council’s objectives and activities set out in the Willoughby City Strategy, which was prepared with most extensive community participation. It confines its attention a few economic constraints, and does not proceed to demonstrate the sensitivity of these constraints to the community’s objectives. That might have been done by reviewing the super-councils created in Victoria, to see if the economic constraints were satisfied, and what changes occurred in achieving the broad range of objectives chosen by Willoughby residents. 2	The six “Target Indicators” are minimally explained on page 11 of the brochure. There is no indication how values are calculated, the correlation and validity of these parameters for forecasting dynamic changes in community and Council achievements or aspirations. On the other hand, many key performance indicators are not mentioned, especially those where developer pressure has led to gross violation (Bowdlerised as “variation”) of Council Local Environmental Plans which were constructed with great diligence by expert Council staff and subjected to repeated COMMUNITY exhibition and Ministerial approval reviews. I would expect to see targets such as average time from lodgement to approval of Development Applications; total Section 94 funds held in trust by Council for specific section 94 projects, and time from completion of accommodation to completion of these projects. Off-street parking is expected to be a prominent future issue, and Councils should provide figures for off-street parking growth as a percentage of residential and employment growth. Growth of Council owned and free parking should also be reported. 3	The third objection is that one highly probable scenario” has been omitted from the short list offered for community dec ision. here are two state ministry silos at play! The Department of Local Government is currently displaying a bottom-up play on amalgamation, giving Councils an opportunity to present their future objectives in a community-preferred format. It will be a challenge for the Department to accept the resulting diversity. The other player is the Planning Department, which has adopted a top-down approach, having arbitrarily divided the State into Regions and Sub-regions. Willoughby is in their Metrostrategy. Willoughby is included in the City and East Subregion, wshose northern boundary is Boundary Street. This would make Willooughby a neglected fringe of the inner metropolis, which will be distracted by the diversity of capiutal c ity activities. 4	It is unlikely there would be a representative democratically selected councillor for each ward, in any amalgamated Council. Our present arrangement of three councillors per ward allows each Ward to be represented by candidates spread over a two dimensional map of political opinion,and reducing the two-sded wnner-take-all “Mandate” attitude fostered in the two leading parties. Willoughby’s present ward size is about the limit for the candidates to be well known to the voters. The larger c ouncils will then to have party-ranked candidate lists, whch deter the voter voting “below the line”. 5	Larger Councils will tend to collect additional duties without these sevices being funded by the State. Representation on regional boards for state lands, schools, hospitals and police are examples. There is a “County” layer of politics in the states of the United States. A County may contain several stand-alone cities and some of the metropolitan sub-urban citiesof an adjoining major metropolis. The sub-urbam US city is often quite small in area. A study of the functional strengths and weaknesses of the US system, and the tendency to restructure these when they reach critical population or size, should precede any attempts to change the size of our Councils. This study would include a large enough sample to identify correlations between “Fit for the Future” Targets, and their validity as predictors of progress towards community strategic objectives.